Today is the 5-year anniversary of the day I adopted my precious kitty Jabberwocky. Or he adopted me, whatever. I don't know that I've ever told the whole story of how we got together, so I will do so now. I was seized with a burning desire to adopt a cat after the death of my previous kitty, a Siamese who technically belonged to my mother but really bonded with me. And I knew I would be joining the Foreign Service soon, and I wanted someone to be excited when I came home from work. A cat seemed easier than a husband. 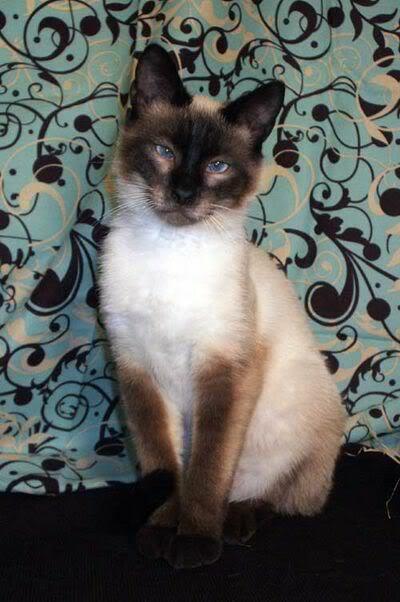 So I did some googling and found the Virginia Siamese Cat Rescue Center. These people are serious about cats. There was an extensive application process. I had to give character references; they did call the references. 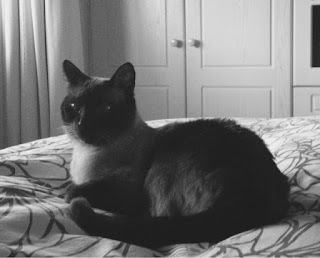 Next there was a phone interview, during which we discussed my previous pet-owning experience and my ability to appropriately care for a feline companion. They had some concerns about the whole FS situation, but I was eventually pre-approved. Pre-approved means you can check out the website and make inquiries about individual cats. Then you have another phone interview with the kitty's foster parent to determine whether you are a good fit for this particular cat. Weeks went by and I got nowhere. One cat had allergies and needed to have good vet access. Another one I liked was six, which was thought to be too old to adapt to my "extreme lifestyle." One freaked out after more than 10 minutes in a carrier. My prospects were not looking good. And then I found The One. That's his kitten photo on the right. How's that for adorable? The Jabberwock was picked up as a stray at about 9 months old, abandoned by his previous owners, and would have been euthanized if the rescue center hadn't had space for him. On the way to his foster home the car he was in got in a pretty serious accident. His carrier was flung to the back of the van and basically destroyed, but he emerged unscathed and completely unfazed by the experience. By god, this was a Foreign Service cat. And now he's my Foreign Service cat. We've lived in 3 countries together so far, with #4 coming up this fall. He's been through 3 transatlantic flights, a 2-week walkabout, and some interesting veterinarians, and come through it all like a champion. And he really does get excited when I come home from work. He's the perfect kitty for me. Coincidentally, June is National Adopt a Cat Month, so if you have a feline-shaped hole in your life that needs filling, consider looking for your new furry buddy at a shelter or rescue organization. Then you too can be as happy as Jabberwocky and me. Smiling big for you and the Jabberwocky (great name too!) - so glad you found each other!